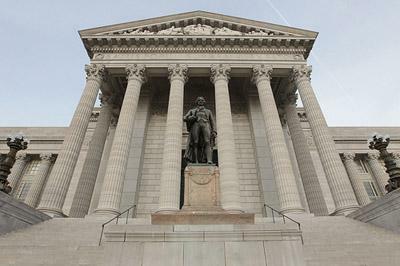 Republican and Democratic House members gathered today to unveil several proposals they say will improve K-12 education in Missouri. The idea getting the most attention is school choice - allowing students from failing school districts to transfer to better-performing schools statewide. Lt. Governor Peter Kinder (R) joined lawmakers in supporting the bill, which hasn't been filed yet. "We have failing schools, and parents don't want to wait for a 4-year, 5-year, 8-year, (or) 10-year reform plan," Kinder told reporters at a press conference. "You're talking about the only chance these children will ever have to get an education." Another bill to allow charter schools statewide will be sponsored by State Representative Tishaura Jones (D, St. Louis). In addition, Jamilah Nasheed (D, St. Louis) says she'll file legislation to do away with social promotion in Missouri. "We have children that are in the third grade, reading on (a) first-grade level, and (their schools) promote them to the fourth grade," Nasheed said. "Now you know and I know if they're not being educated, they're gonna be incarcerated." Other proposals include requiring merit pay for public school teachers, and using tax breaks to fund scholarships for developmentally disabled students to transfer to private schools or better-performing public schools. That proposal is also known as Bryce's Law. A staff member for House Elementary and Secondary Education Committee chair Scott Dieckhaus (R, Washington, Mo.) says all of the proposed bills should be filed before the end of the week. 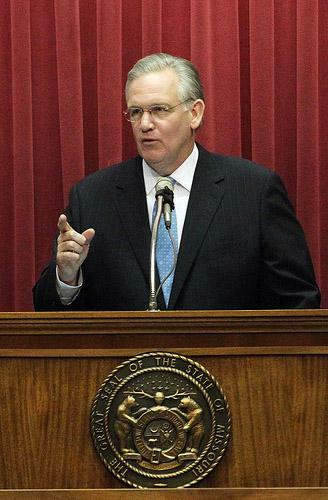 Governor Jay Nixon spent a few minutes with reporters in Jefferson City today, answering questions about education and other topics.